Itchy throat? Tick. Swimmy ears? Tick. Unspecified achiness? Tick. Must be the annual pre-Spring cold…and I’m ignoring the maxim and medicating with tea and carrot cake. It makes the fact that the seedlings I blithely stuck in the greenhouse have been frosted into the afterworld a little less difficult to bear. And maybe that’ll teach me not to risk sowing early. I do have many, MANY chillies and sweet pepper seedlings at home. Including (o, frabjous day!) Fish chillies. These are fresh seed I swapped for oca with Thomas Etty and were pre-soaked for a few hours before sowing. Fish chillies have failed me 2 years running. I was beginning to think they and I were just not destined. But these shot through in just a few days. 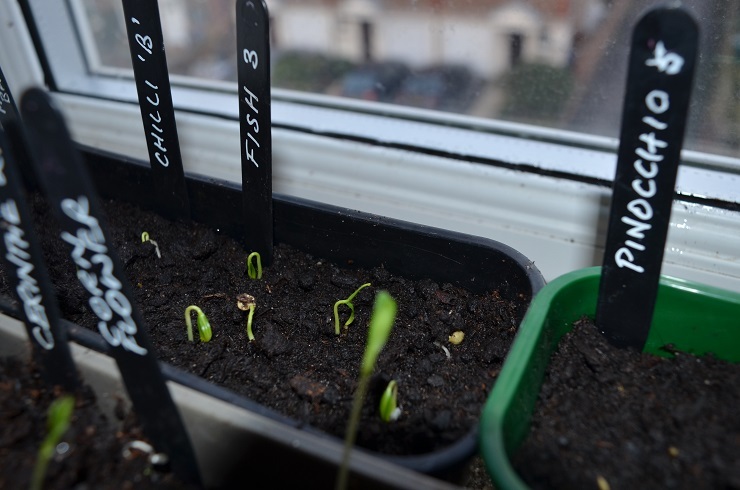 There’s no more space under the growlights so it’s time to break out tin foil collars for seed trays and start the 2016 windowsill hokey-cokey. I really appreciate how supportive my friends and family are of my allotmenteering. When my neighbours across the landing had wardrobes delivered this weekend, they offered me the cardboard as new path underlay. Which is lovely given #92’s very boggy. It’ll be so great not to slip-slide into the greenhouse! There’s a great micro-brewery not too far away, which I stumbled over (sadly not post-beer!) the other day. 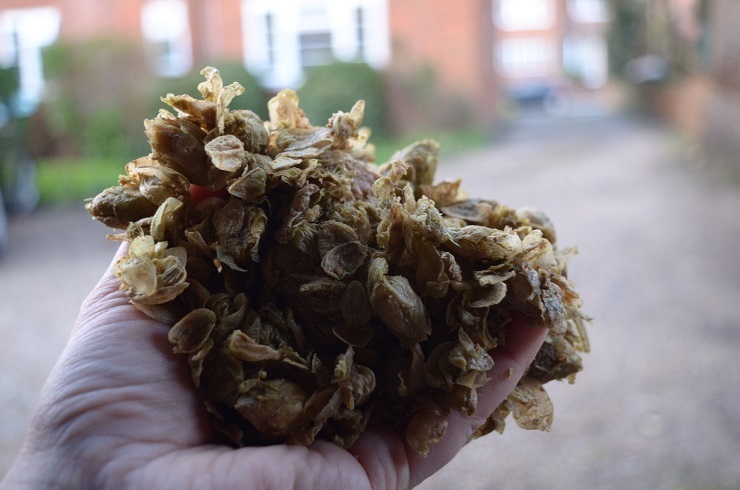 So I now have a steady supply of spent hops and/or spent grain for the plot – as many bags as I want. So hops in the compost, hops mixed into the leaf bins and hops as a thick mulch under the goosegogs. I do need to warn one of my plot neighbours and my Plot Assistant as both have dogs, and the last thing I’d want is for them to be poisoned. The goosegog mulch will happen after the nets go on, just in case hops poison foxes too. Am so envious of your seed circle. I just bought Babbington leeks and egyptian walking onion and they weren’t cheap. It is my third year with a plot and over the last few months have been plotting perennial veggies and increasing fruit but sadly I am too much of a newby (seed saving only recently pinged my horizon) to have anything to swap. Next year hopefully will be different. Really enjoying your posts. If you’re interested (g’wan, g’wan, g’wan!) I’ve started one on Twitter, and there’s also one I run on John Harrison’s site (http://chat.allotment-garden.org/index.php) though you have to be a site member there to see it. 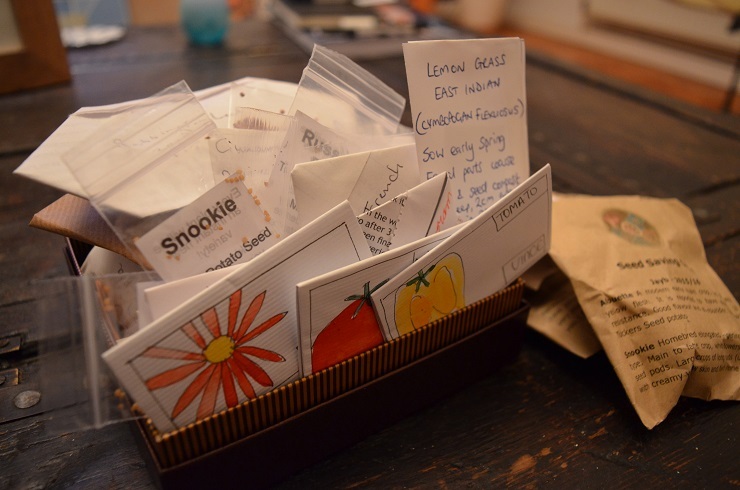 Both open to all and with not that much effort there is a nice package of seeds just after Christmas.. Lots of crops are easy to save from – I’ve put up a page with the resources/links I use on this site – they cover most things I think.